My new baby is enjoying the new fluffy bedding as much as I am it seems. Yesterday’s Ikea trip was exhausting, but totally worth it in the end. It feels like the bed has been upgraded to a new standard. Today’s been a busy day of cleaning, scrubbing and getting old quilts and sheets packed away for Oxfam. There’s still some stuff to do, like the kitchen, which is a tip, but mostly the flat is already feeling fresher, calmer and airier. 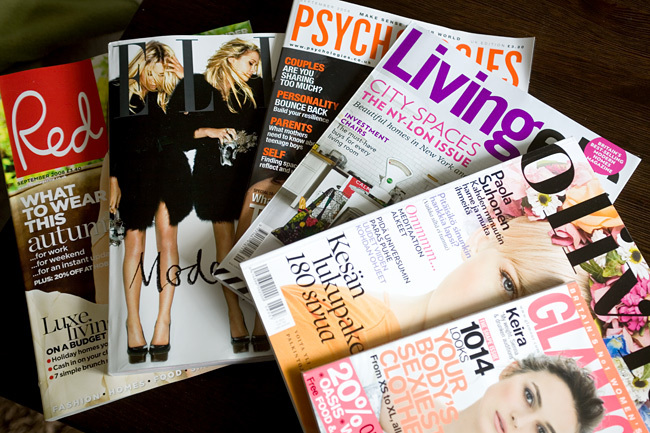 When I’m done with rest of the cleaning I’m going to finally dive into this month’s magazines. Nice notebook, but you do know that reading physical magazines is so 1992. Uusi lapsukaisesi on tosi linjakas! My pile of magazines (brought by hubby from Finland) are still waiting.. too much stuff to do… damn.